The Angels' No. 10 prospect is still near the beginning of his third season in the United States, but he's already developed the ability to put his personal stamp on an outing. "It was a typical Jaime Barria start," Class A Advanced Inland Empire pitching coach Michael Wuertz said after Wednesday's gem. "He's a complete pitcher, and that's pretty impressive at 20 years old." While his coaches have come to expect the right-hander's quick work and poise, the result stood out as his best this year. 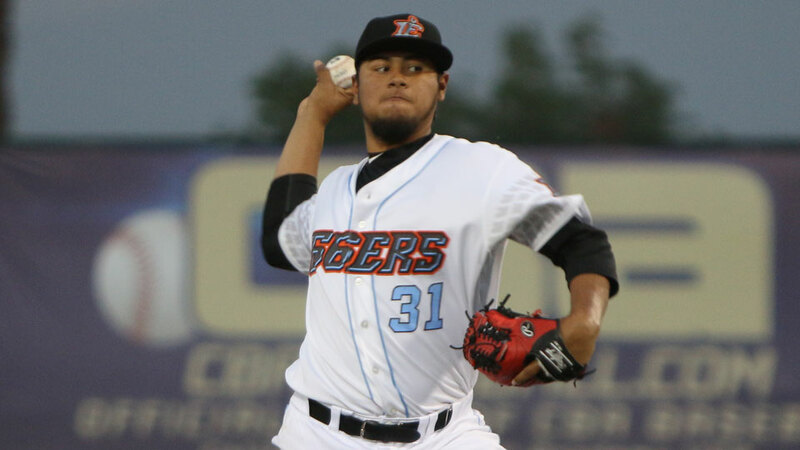 He allowed two hits and two walks while striking out four over seven shutout innings in the 66ers' 4-3 comeback win over the visiting Lancaster JetHawks. "He did everything that he needed to do to come away with a win," Wuertz said. "Unfortunately, we gave up a couple runs late in the game. But he did everything he could have done." Making his sixth start of the year, Barria (1-2) lowered his ERA to 2.67. That number would be 1.24 barring an April 22 outing in which he gave up six runs over four innings at Rancho Cucamonga. "He is who he is. He doesn't let anything get to him. The outing in Rancho, his stuff wasn't as crisp. His fastball wasn't coming out as clean," Wuertz said. "These last couple outings, his fastball had some life back on it. He was executing pitches behind in the count and executing pitches ahead as well." The native of Panama cruised out of the gate, allowing only a third-inning bloop single off the bat of Hamlet Marte through the first four frames. "He was getting ahead in counts, getting early contact," Wuertz said. "He commands the zone so well with his fastball, and not only on the bottom of the zone. He pitches well on the top of the zone and gets a lot of weak contact, a lot of popups, some ground balls." Although the California League isn't an ideal circuit for even weak-contact fly balls, the Angels organization isn't interested in trying to make Barria work exclusively in the lower half of the zone. "It's part of his game. It doesn't matter if he's in California or Florida or wherever he may be -- we're not going to take away from what his strengths are," the 66ers coach explained. "It's part of his game, and whatever makes him successful and gets him to Anaheim is what we want him to do. That's our goal." Barria saw traffic at the start of the fifth and sixth innings -- with No. 30 Rockies prospect Sam Hilliard lining a single to open the former and No. 19 Garrett Hampson walking to lead off the latter. Each got into scoring position -- Hilliard advancing 90 feet from home with one out -- but the young hurler left them there. "That's who he is. With a runner on third and less than two outs, he finds a way," Wuertz said. "He digs deep and makes pitches. That, to me, is the sign of a polished pitcher." After a 1-2-3 seventh, he'd thrown 80 pitches -- 55 strikes and gone as deep as he ever has as a pro, tying a personal best he set in the Rookie-level Dominican Summer League on July 25, 2014, the year after he signed. "Any time you can get early-contact outs, that's what you want to see," Wuertz said. "He was putting guys away early. He got a lot of three-pitch-or-less outs. If he keeps that going, he's going to have a lot of success in this league." After Lancaster took a 2-1 lead with one run in the eighth on a single by No. 13 overall prospect Brendan Rodgers -- and an insurance run in the ninth, 16th-ranked Los Angeles prospect Connor Justus tied the game with a two-run dinger -- his first Cal League home run -- in the bottom of the frame, and Cody Ramer plated Brendon Sanger with a walk-off hit. The JetHawks' Colin Welmon also turned in his finest start of the year, allowing a run on four hits and two walks over seven innings.